It's hard to believe that this little mama's girl has been a part of our family for an entire year now. It feels like we just welcomed her yesterday. My husband and I figure that we'll only be able to get away with a Groundhog Day birthday party theme for one or two birthdays, so we took full advantage. Happy Groundhog Day and Happy 1st Birthday little one! On an entirely different subject... I would like to thank all of my readers who have been hanging in there with me for the past month or so. I haven't been posting or creating as often as I used to. About mid-December blogging started to feel like a chore and wasn't as much fun as it was when I first started. I was taking it way too seriously, literally staying up all night on occasion to get a post written or a project done, and I was burning myself out. I love blogging, but I needed to take a step back and reevaluate and prioritize. I was feeling down about not having any projects to post about when I read this post by Erica at B is for Boy. What struck me is when she came to the realization that she doesn't always have to post about crafting. Hello?!? Why didn't I think of that?!? If I don't have a project to share, that doesn't mean that I can't post anything. There are plenty of other things I can post about. I haven't really posted much that isn't craft, sewing, or decorating related before, but I think I'm going to start. This won't turn into a personal journal or anything like that... this blog will still focus on craft and sewing projects and handmade in general. But if I have something on my mind, I'm going to blog about it. And if its been a few days and I haven't had time to sew or create anything, you may get a recipe out of me or a story about something that happened that day. To get to the point, I'm going to stop stressing and start posting. I hope that's OK will all of you. I have been sewing, and I will be sharing those projects with you in a post later this week. Thanks for sticking with me. Those groundhogs are absolutely adorable!!! Your little one is growing up, first birthdays are so special, enjoy the celebrations! Happy Birthday to your daughter! Did you save an extra cupcake for me? They look so good! Gwen, I know how you feel about blogging. You want your readers to be happy but you also want to feel sane yourself. LOL Can't wait to see alternate posts from you! Happy birthday to your little girl! 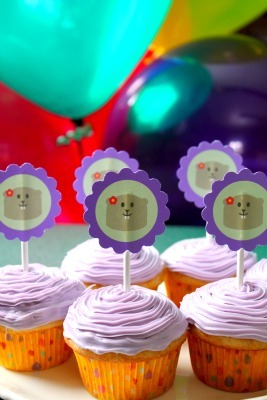 Those cupcake toppers are SO cute! Do you make them with a scroll circle punch and a regular circle punch? Or using a Silhouette cutter? What size is the purple scroll circle versus the groundhog circle? I'm trying to make some but having trouble getting my dimensions right. Thanks! Those are some of the cutest groundhogs I've seen!! Looks like your little lady enjoyed her birthday!! What sweet cupcakes Gwen! They look so yummy. You are right about the blogging. And you are not alone. While most everything on my blog is about crafting, I've taken the pressure off by posting less (max: 3 times a week), by doing small projects, by sometimes doing process posts among other things. Sometimes, I dare say, I have simply not commented on every post on all the blogs that I follow, as well. It isn't possible to be everywhere, all the time. You do have to care for yourself and your family first. No question. Keep your sanity, and enjoy your blog! Happy birthday, little one! Darling cuppy cakes. My dad's favorite movie is Groundhog Day. I always wake up with "Good morning woodchuck-chuckers" in my head on Feb 2. Happy 1st birthday to your little sweetie! So cute that you incorporated Groundhog's day. I know what you mean about blogging and feeling like you need to post - but just post whatever is going on in your life and I'm sure people will be happy to see it! What a fun birthday, and what a PRECIOUS little one year old! Too cute! I'm refering to the child AND the cupcakes. I love that you used purple for a girly touch! I look forward to hearing more "stories" and some of my favorite recipes were discovered on craft blogs - I'm sure your blogging future will hold great things! 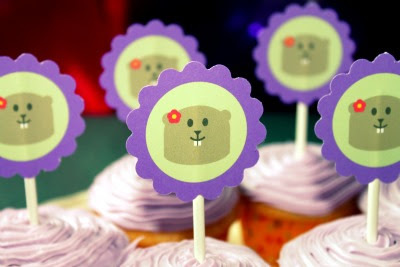 I don't know- I had a friend who's birthday was Feb 2 and she made a big deal of the groundhog day thing even through High School- you might get lucky and you can keep using these cupcake toppers- they are darling! Yay! I am so glad that you have realised that...what an epiphany for you. I am probably like others who just enjoy your company so really don't mind what you blog about...it's just good to have you around. Love your Groundhogs...she may love them so much too that she will want them to be her 'special thing' on birthdays. Your daughter has the cutest little cheeks!! Just so squeezable!! What a sweetie. If you feel you have to post craft stuff you've done every time then no wonder you felt burnt out. You poor love. I'm sure everyone feels like that from time to time. Part of the fun of blogging is working out what works best for YOU!! And another fun part is finding people that you really like that you wouldn't get the chance to meet otherwise....yes, missy, I'm talking about YOU!! Your little groundhogs are so adorable!!! Okay first, Happy birthday to your youngest!!! Goes fast with the second doesn't it? Second, ADORABLE groundhogs/cupcakes! You make the cutest printables. Third, I'm so glad you have taken a new approach to blogging. Yes you want your readings to be happy but if your not then that will definitely show through your blog. Thanks to seeing it on Lu's blog I to blog without obligation. Somehow it took the pressure off. I personally like to get to know the blogger behind the blog. Ummmm those are the cutest groundhogs!!! So funny!! 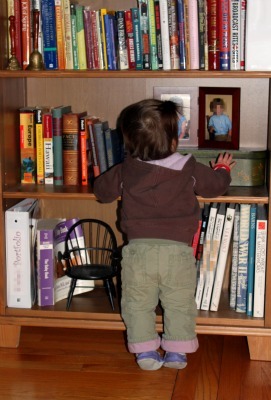 I think I'm going to take your approach to blogging, too. It makes so much sense, but it's easy to get caught up in it all sometimes. 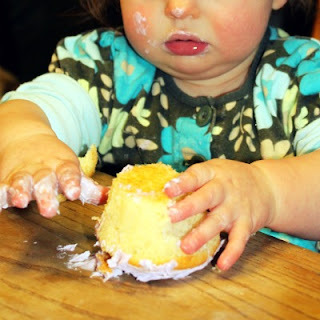 Thanks for sharing and happy First Birthday to your baby girl! Oh goodness those groundhog cupcakes are too cute, who'd have thought ground hogs could be so sweet! I hear you with the expanding your blogging topics. Only posting crafts can be exhausting and I think it's best when readers get to know a little bit about the blogger behind the projects. It's nice to make connections with others.